Nicholas isn’t the only Arata who grew up surrounded by trees. The farm is owned by his father, Mike Arata, and has been in the Arata family for 4 generations; this Mike Arata, the third in the family, grew up working on the farm with his grandfather, Mike Arata I. 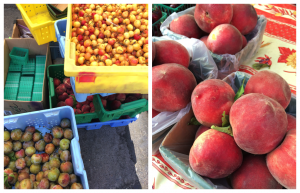 Now, the Arata farm continues to sell produce at local markets, including MCM, and at their stall in Brentwood. This week, Arata’s table is in transition. Though some fruits, like cherries, which had an especially early crop this year, are on their way out, shoppers have plenty to look forward to. The table is spotted with figs, pluots, santa rosa plums, wesley apricots, and angelcots. And next week, the Reginas will come in. 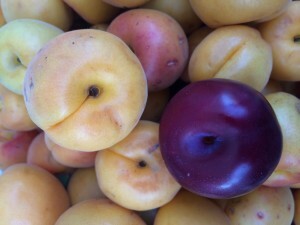 Left: Arata’s peaches, cherries (done for the season), and pluots. Right: Along with their yellow regina peaches, Arata has a grove of white peach trees. As I speak to Nicholas, he and his father call back to each other. “How long have we had the Reginas?” Nicholas asks. It is apparent that Arata is a collaborative farm––as the two banter, they swap information about fruits. And as I speak to the Aratas, it becomes clear that they know their trees like they are a part of the family. 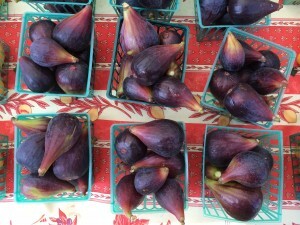 Arata’s black mission figs, which they hand pick from their crop. 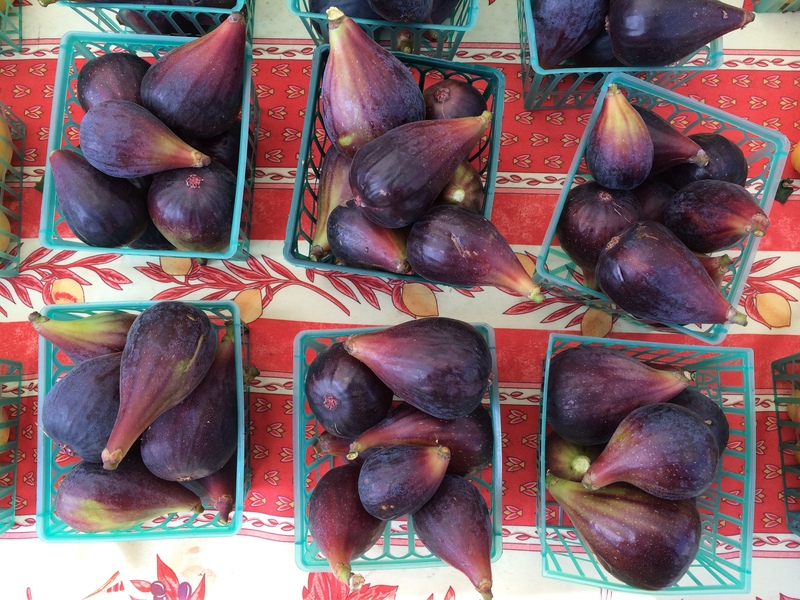 Figs are versatile and add subtle sweetness to a variety of dishes. They can be made into jam or dressing, or used in salad, tartlets, cake, crumble , or–the option I’m salivating over–creme brulée. Another highlight are Arata’s white apricots, called angelcots. “They’re a new item for the states,” Mike tells me. The two try to figure out where angelcots are most popular––Nicholas thinks that they come from the Middle East, and, in fact, he’s right. Angelcots are the hybrid of Iranian and Moroccan apricots. Angelcots look like white apricots and taste sweeter than their familiar counterparts. Try angelcots in a pastry or with goat cheese for a quick and fulfilling snack. And on Thursday, be sure to stop by and check in on Arata farms––they’ll treat you like family. At the Twin Girls Farms booth, kids circle the cherry samples, grabbing fistfuls of the fruit and grinning. One jumps up and down. “Yay cherries!” he smiles. The booth’s proprietor Jimmy Egoian smiles too. After a few weeks away from Mission Community Market, Twin Girls has just turned the corner from winter season. 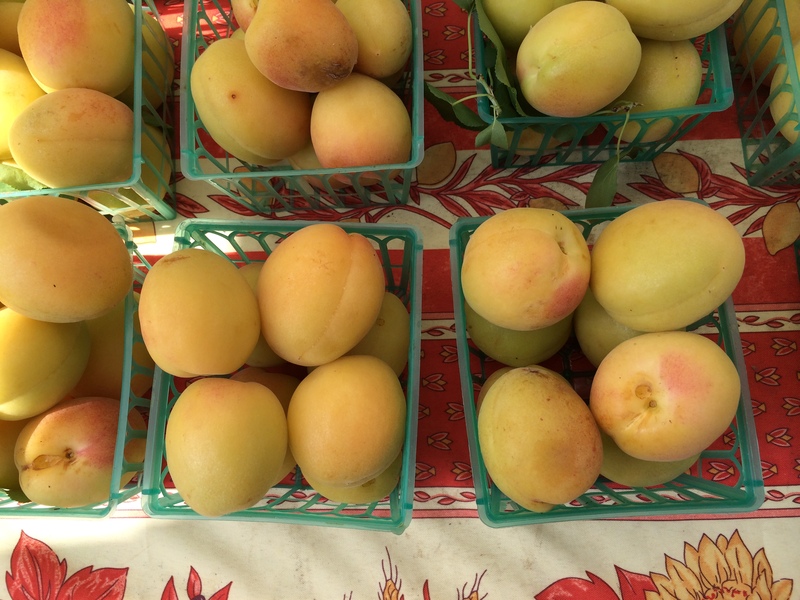 Their tables are a testament to the warmer weather, and favorites, like yellow and white peaches, are piled high; there are signs pointing to new gems, too––pluots, donut white peaches, apriums, and loquats. I spoke to Jimmy about Twin Girls’ mission, what makes a good fruit, and how to tell the difference between a pluot and an aprium. Twin Girls is not a superficial farm. “We don’t care what fruits look like,” Jimmy says. “If it eats good, it is good.” In fact, Jimmy explains that bad looking fruits are better tasting. “If it’s cracked,” he says, “it is ten times better.” The cracked fruits have a higher sugar content than their smooth-surfaced companions. When the fruits are growing, that sugar content causes the insides to grow faster than the outside, leading to skins that split and then re-heal. Scarred (and sweet!) nectarines at Twin Girls Farm’s booth. It’s clear that shoppers respond to Twin Girls’ commitment to eating. Today, visitors are reaching for the new editions to Twin Girls’ table: apriums and pluots. Can’t tell the difference? Jimmy let me in on the secret––“apriums,” Jimmy notes, “are just backwards pluots.” What he means is that both fruits are combinations of apricots and plums, but they differ in composition; while pluots are about 75% plum and 25% apricot, apriums are the opposite. Apriums, like any other fruit, come in a variety of strains. The best one, flavorellas, are also the most rare––Jimmy tells me that farms can only grow about 10 to each tree. In comparison, the aprium strain that Twin Girls has on it’s tables, tasty rich apriums, grows 200 aprium fruits on each tree. Another unique strain of stone fruit that has become a family favorite is the donut peach. Twin Girls has white donut peaches, and when Jimmy hands me one to taste, its sweetness is so concentrated I feel like I’m eating candy. That isn’t because of the donut shape, though, this donut strain just has more sugar. But the distinctive shape is a favorite with kids, who find the oblong shape easy to hold. Adults, too, flock to the donut peaches––perhaps reminiscing about their own childhood. Yellow peaches are more acidic than their pale counterparts, which gives them that distinctive “tang” that works well in pies and on the grill. And what is the taste difference between a white and yellow peach? White peaches, distinguishable by their paler, pink skins, are sweeter, and thus more easily bruised. Yellow peaches are more acidic than their pale counterparts, which gives them that distinctive “tang” that works well in pies and on the grill. 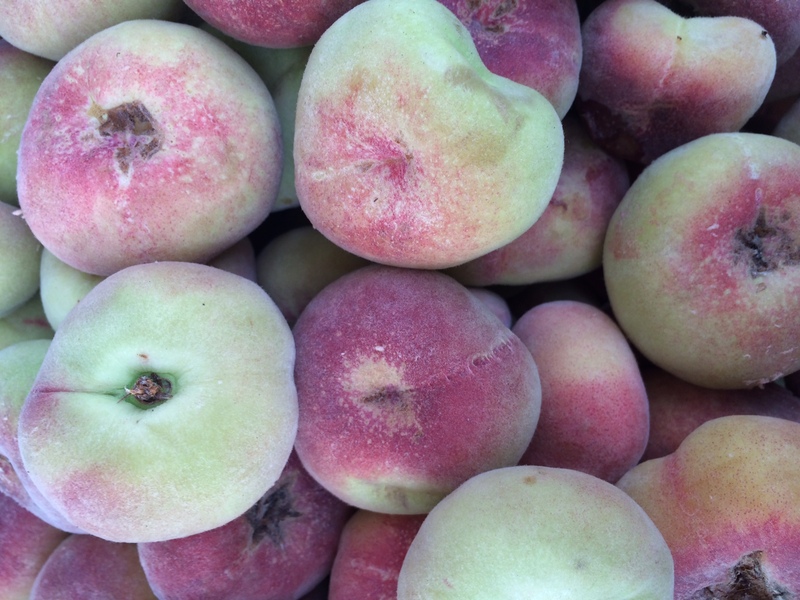 Try white peaches on their own, with salsas or ceviche, or in drinks. White peaches are sweeter and less acidic than yellow. One more fruit that I’m interested in is grown in bunches on thick, brown stems. “That’s a loquat,” Jimmy notes, “it’s an old type of fruit.” It may be old, but its introduction to shoppers at Mission Community Market is recent. 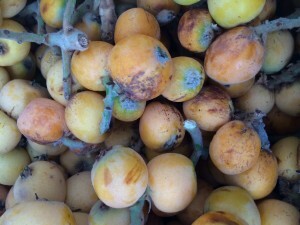 Loquats, which are ripe in the late winter or early spring, and may not be at the market for much longer, are sweetest when they are soft and orange. When I bite into the loquat that Jimmy hands me, I’m reminded of a lychee. Try loquats in jelly, compote, or even wine. 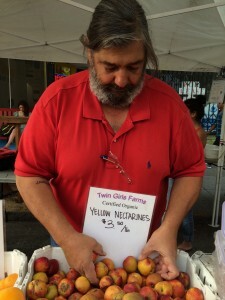 The farm started with yellow peaches a few weeks ago, which Jimmy tells me is about “10 days earlier than early.” But “no matter what,” he continues, “from year to year everyone wants a yellow peach.” To determine when peaches, and other stone fruits like them, will become ripe, farmers look at the “bloom” of the plants. When the bloom comes in farmers can determine whether their crops will be early, on time, or late. 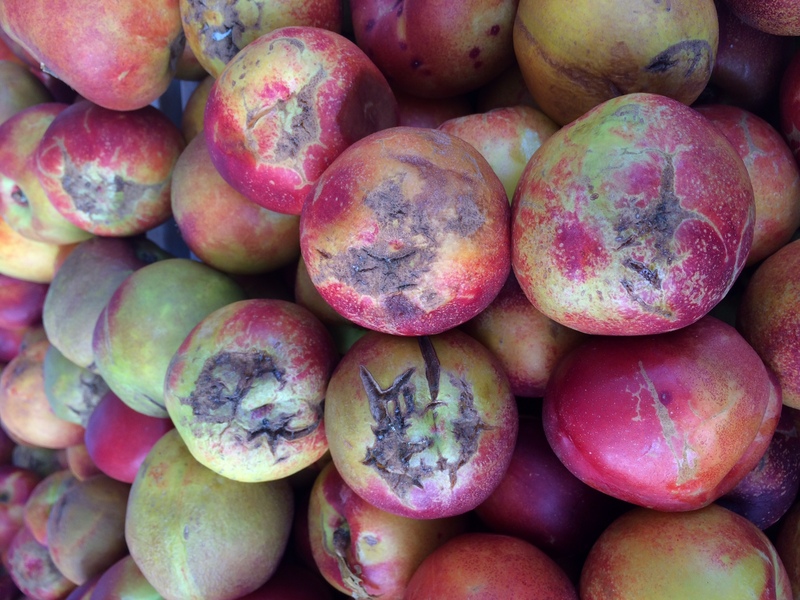 Early doesn’t necessarily mean better; Twin Girls’ peaches may have grown premature due to a dry winter. But Jimmy cautions against drought fear-mongering: “we’ve been dealing with little water for 6 or 7 years,” he says. As you approach the market from Valencia and down 22nd street, you may see what appears to be a stall full of lush grass and a happy smiling man. 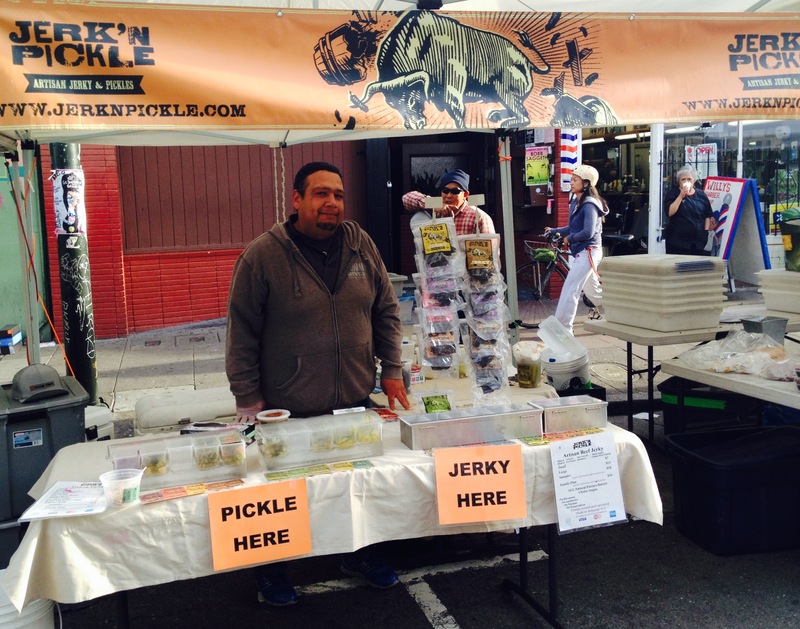 This is one of Mission Community Markets newest vendors, Lifefood Gardens, and the smiling man you see there each Thursday is Loren. 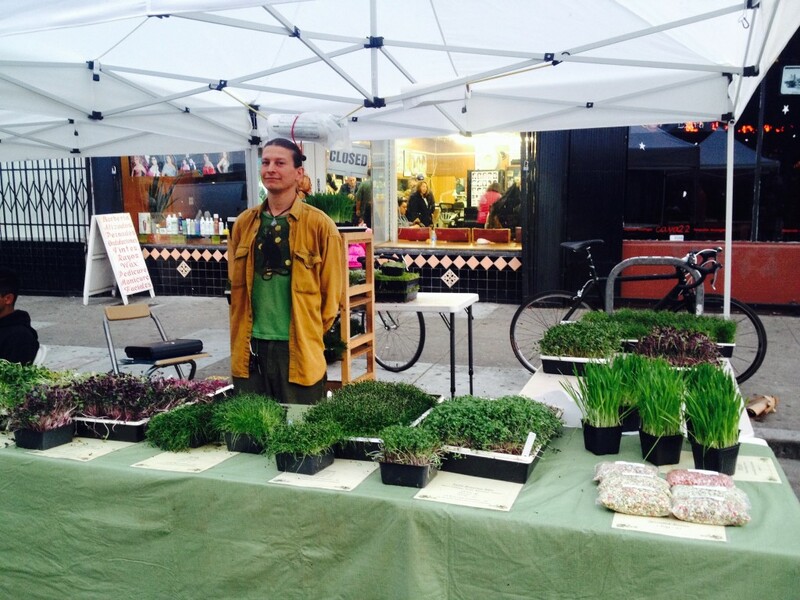 He represents his girlfriend Katy’s business of growing and selling a variety of microgreens. They began growing microgreens in a sprout machine, and eventually moved to growing these baby plants in their bathroom, kitchen, and various other places in their small SF apartment for personal consumption. Katy, who has been a raw foodist for 13 years, developed an innate passion for growing microgreens within her home. When Katie got fed up with working in the software world, she decided to begin a garden. After success with their small personal microgreen operation, they purchased land up north in Lake County and built a large greenhouse to begin their dream garden. They originally planned to grow off-season tomatoes, but found that microgreens provided them with a financially viable and consistent harvest, as well as nutritious and delicious food. One and a half years later, they’ve grown their business to reach across the entire Bay Area, serving ten different farmer’s markets (six here in SF alone). 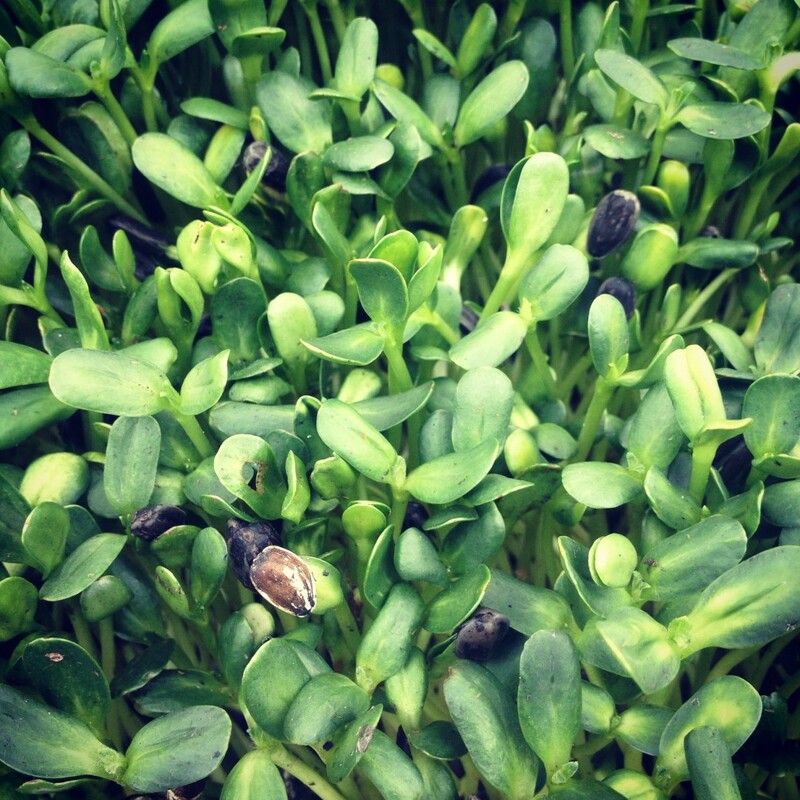 Microgreens are just what they sound like –baby versions of many of the greens you know and love. Many studies show that microgreens may house more nutrients and vitamins than their adult forms, making microgreens an affordable option to get your daily dose of vitamin C, E, and beta carotene to name a few. Stop by MCM each week on Thursday from 4-8pm to pick up a tray of microgreens to improve your health, boost your immunities, support a local business, and make a friend. Some of the different varieties include sunflower, garlic, onion, broccoli, mixed greens, radish, wheatgrass, and more. Not sure what to do with these fresh greens? Check out this week’s recipe highlighting sunflower microgreens in a healthy salad! We’ve got so many great new vendors at the market this season! 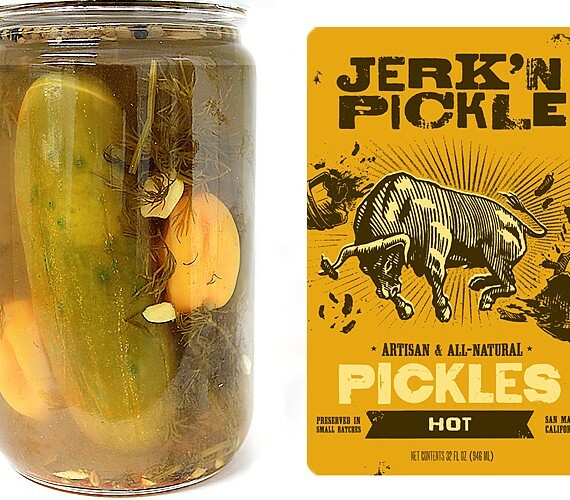 One of our newest vendors at the market is Jerk ‘N Pickle, offering an array of pickles and beef jerky, from spicy to sweet to savory! Currently this vendor is at the market bi-weekly, so every other week you will find their stall in line with some of our liveliest new vendors: Grandma’s Homemade Jam and Papi Chulo Salsa. If you’re lucky enough to pass by Achadinha Cheese Co. when there are not five others sampling their delicious products, you may be given a bit of cheese to try with a sweet pickle! That’ll be sure to get your taste buds dancing (if Papi Chulo’s music and salsa hasn’t already! ).